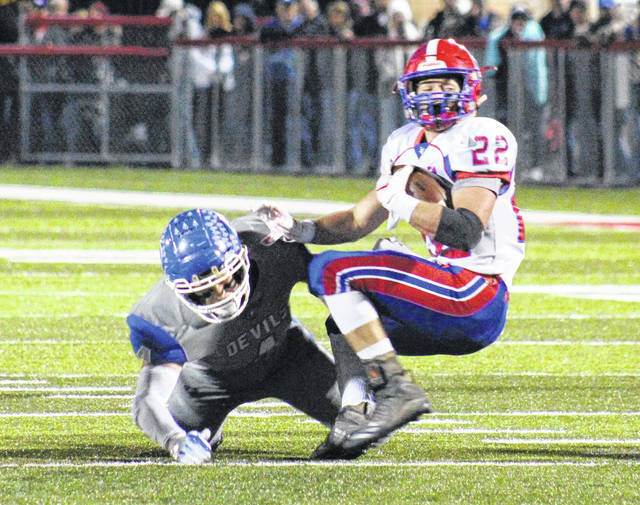 Gallia Academy senior Jacob Campbell knocks Licking Valley running back Connor McLaughlin down for a loss during a Division IV, Region 15 playoff contest at Alumni Stadium in Jackson, Ohio. Meigs senior Zach Bartrum (1) makes a stop on Gallia Academy sophomore James Armstrong during a Week 1 football contest at Memorial Field in Gallipolis, Ohio. Far from unlucky for this baker’s dozen. A total of 13 people from the Ohio Valley Publishing area were named to the 2018 Ohio Prep Sports Writers Association Southeastern Ohio All-District football team for Division IV, as voted on by numerous media outlets within the southeast district. Gallia Academy led the area — and all of D-4 for that matter — with nine total selections, while Meigs came away with four honorees on the list. 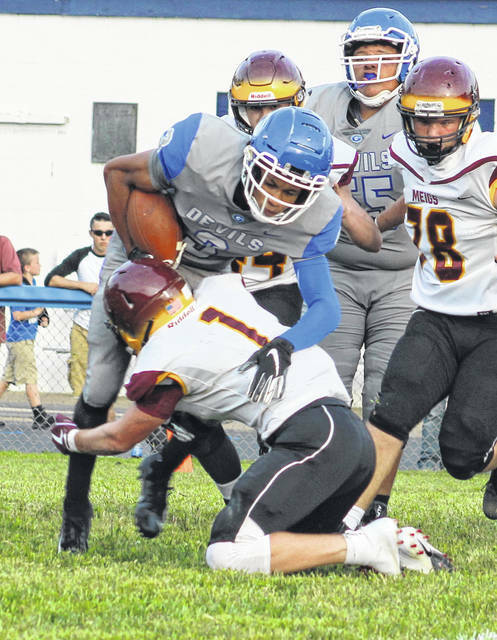 The Blue Devils (9-2) went unbeaten en route to the program’s first-ever Ohio Valley Conference championship, which also came in an outright fashion. GAHS second-year coach Alex Penrod was chosen as the Division IV Coach of the Year, with senior linebacker Jacob Campbell also coming away with the D-4 Defensive Player of the Year award. Campbell was joined on the first team defense by junior linebacker Cade Roberts. Senior quarterback Justin McClelland and senior running back Lane Pullins were named first team in their respective offensive categories. Sophomore James Armstrong was a first team offensive selection as an all-purpose player, while sophomore Riley Starnes was chosen to the first team offensive line. Senior Cory Call and junior Mason Angel were also selected to the special mention list on behalf of the Blue Devils. McClelland completed 83-of-136 passes for 1,158 yards and 10 touchdowns to go along with three interceptions. McClelland also ran 119 times for 717 yards and eight scores. Pullins rushed for 792 yards and 12 scores on 133 carries. Campbell made 82 tackles, including 15 for loss, and forced a pair of fumbles at linebacker. Roberts made 72 tackles, including six for loss, and had two fumble recoveries at linebacker. The Marauders had two first team selections on the D-4 team, with one coming from each side of the ball. Senior Zach Bartrum was a first team end on the offensive side, while senior Cole Adams was a first team choice as a defensive back. Freshmen Ty Bartrum and Coulter Cleland were also special mention choices on behalf of Meigs. The Marauders went 4-6 overall and tied Nelsonville-York for second place in the TVC Ohio Division with a 4-2 mark. Easton Wolf of Waverly was named the D-4 Offensive Player of the Year. Ends: Dillon Steward, Wash. Court House Washington 6-1, 170, Sr.; Omar Porter, Wash. Court House Washington, 6-1, 200, Sr.; Gavin Hunt, Proctorville Fairland, 5-11, 150, So. ; Reilly Sowards, Proctorville Fairland, 6-2, 160, Jr.; Zach Bartrum, Pomeroy Meigs, 6-1, 185, Sr.; Easton Wolf, Waverly, 6-3, 180, Sr.
Linemen: Dalton Ford, Chillicothe Unioto, 6-4, 295, Jr.; Riley Starnes, Gallipolis Gallia Academy, 6-4, 290, So. ; Macayne Bock, Waverly, 6-3, 285, Sr.; Bradlee Griffin, McArthur Vinton County, 6-2, 250, Sr.
Quarterbacks: Zach Gibson, Williamsport Westfall, 5-10, 190, Sr.; Justin McClelland, Gallipolis Gallia Academy, 6-1, 205, Sr.; Gio Thomas, Wash. Court House Washington, 5-11, 200, So. ; Joel Lambiotte, Proctorville Fairland, 6-2, 190, Sr.; Haydn’ Shanks, Waverly, 6-3, 185, So. Running backs: Tylor Wolfe, Lancaster Fairfield Union, 6-3, 190, Sr.; Lane Pullins, Gallipolis Gallia Academy, 5-11, 195, Sr.; Christian Vance, New Lexington, 6-0, 181, Jr.; Cade Sibner, McArthur Vinton County, 5-9, 155, Sr.
All-Purpose: Jamarcus Carroll, Chillicothe Unioto, 5-9, 200, Jr.; James Armstrong, Gallipolis Gallia Academy, 5-11, 175, So. ; Payton Shoemaker, Waverly, 5-9, 155, Jr.
PK: Christian Fetters, Chillicothe Zane Trace, 5-10, 162, Jr.; Grayson Diener, Waverly, 6-2, 155, Jr.
Linemen: Jayden Hammond, Williamsport Westfall, 6-2, 175, Jr.; Kieran Place, Chillicothe Zane Trace, 6-0, 185, Sr.; Richard Burns, Wash. Court House Washington, 6-5, 255, Sr.; Tim Diamond, Chillicothe Unioto, 5-11, 215, Jr.
Linebackers: Chance Smith, Chillicothe Unioto, 5-9, 195, Sr.; Jacob Campbell, Gallipolis Gallia Academy, 5-11, 225, Sr.; Cade Roberts, Gallipolis Gallia Academy, 5-10, 215, Jr.; Dakota Swepston, Waverly, 6-0, 200, Jr.; Seth Burgess, New Lexington, 6-1, 210, Jr. Defensive backs: Cole Adams, Pomeroy Meigs, 6-0, 155, Sr.; Eric Anderson, Greenfield McClain, 5-11, 150, Sr. Offensive Player of the Year: Easton Wolf, Waverly. Defensive Player of the Year: Jacob Campbell, Gallipolis Gallia Academy. Coach of the Year: Alex Penrod, Gallipolis Gallia Academy. Bowen McConahay, Circleville Logan Elm; Johnny LaRock, Lancaster Fairfield Union; Coleby Axe, Lancaster Fairfield Union; Chanston Moll, Williamsport Westfall; Elliott Lynn, Chillicothe Zane Trace; Austin Carroll, Chillicothe Zane Trace; Jamie McCane, Wash. Court House Washington; Alec Haggard, Wash. Court House Washington; Kenton Richter, Chillicothe Unioto; Cris Roberts, Chillicothe Unioto; Blaine Cremeans, Proctorville Fairland; Michael Stitt, Proctorville Fairland; Jacob Rankin, Proctorville Fairland; Mason Angel, Gallipolis Gallia Academy; Cory Call, Gallipolis Gallia Academy; Ty Bartrum, Pomeroy Meigs; Coulter Cleland, Pomeroy Meigs; Zeke Brown, Waverly; Ethan Brooker, Waverly; Jake Hoover, New Lexington; Cooper Tharp, New Lexington; Dalton Mischal, Greenfield McClain; Logan Ward, McArthur Vinton County.